On Monday the 11th September Dave Tilly and Donnacha McCarthy set out for Rotterdam. Thanks to weekend overtime work at the Bicycle Design Centre, Naas, their tandem was repaired just in time and ready for the World Championship in Paratriathlon. 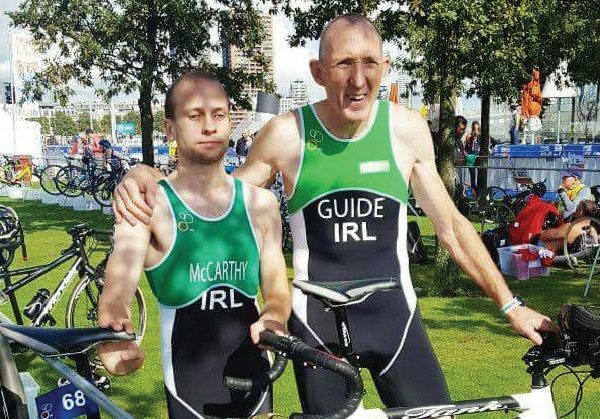 Donnacha is a blind para-athlete and Dave is his sighted guide runner who has had a long passion for the triple sports event. Donnacha had lost his sight, due to illness, aged 11 in 2001 and what he missed the most was playing GAA and football. Now he describes himself as a multi-sport athlete and his focus has shifted to track, road and water thanks to a seemingly fated meeting with Tilly, who explained why they didn’t stop at just running together. Tilly, who I talked to on a Tuesday evening just before they set off on their regular run, says “We met in September 2016 here at the stadium with Crusaders and just before Christmas that year I had convinced him to take on triathlon.” Actually, it was his brother Eamonn Tilley, head coach from Paratriathlon Ireland who brought them together. On the track, bound whether they are joined together wrist-to-wrist, or separately on their own, Donnacha and Dave, clock up to between 50-60 km per week and that’s just running. That may be good practice for the open, salty water they face in competition, but for speed and technique Sportsco offers them one lane in the evenings for something a little more comfortable and perhaps safer for training. For the cycling part, they use a tandem with Dave up front and in swimming it goes as follows: “We go leg to leg. It’s easy – for us, “ says Donnacha. In cycling, they train with support from Arcane CC to get their time for 20km under the mark of thirty minutes. Donnacha also has a turbo trainer at home to endure and get over moments of jelly legs.The race course plus the weather plays its part. Their first race this year, mid-January, was the Naas Duathlon, where they won a silver medal. This was followed by gold in the National Championships in Galway this summer. This event not only got Donnacha his first points for world-ranking but also booked them their tickets for the trip to Holland They travelled to Rotterdam for the open power race category event. This comprised of a 750m swim, 20/25km cycle on the bike and finishing off with a 5km run. Donnacha displays only a hint of regret, because his aim is not just to represent Ireland on international level but to pick up titles and medals as well. The race in Rotterdam saw them just finishing outside the medals after Donnacha had to overcome cramps in the swimming opening part. So the disappointment was minimal and it simply sets the goals for the next season. “It was a great experience. The fourth place is an excellent result for our first international race. A long winter of training for year two of our triathlon adventure. We will get a medal next year.” Fun and joy as it is to train and compete, to travel, without their families’ support Donnacha and Dave wouldn’t have achieved what they did in year one together on track, on the bike or in the water. One big event in Donnacha’s and Dave’s calendar is already marked in red for sure: the 2020, Paralympics in Tokyo.